The nocturnes are both cast in the typical ABA form, with a clearly projected homophonic texture in the A section, and a contrasting texture in the B section. 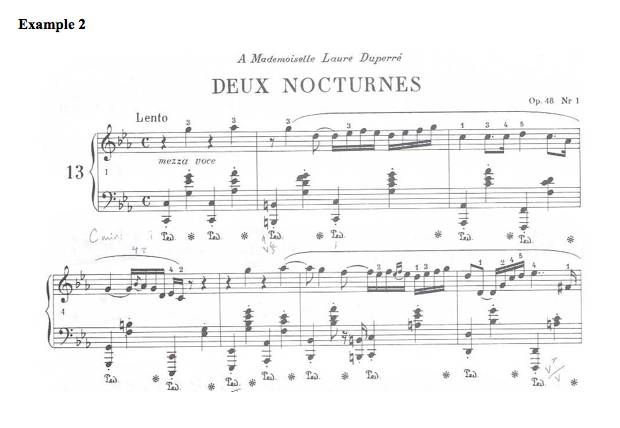 In the F major nocturne, the A section features the nocturne texture that Chopin used so well: a vocal-like melody in the right hand with the standard nocturne accompaniment of broken chords in the left (Example 1). The C minor nocturne features the same vocal-like melody but with a slow “oom-pah” accompaniment in the left (Example 2). 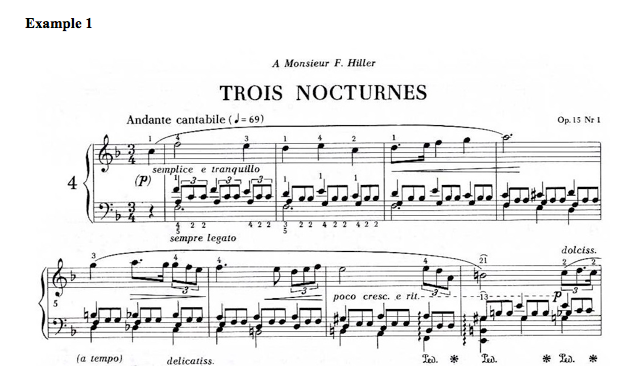 Both nocturnes also have a B section that adds drama to the piece. It explodes right from the start in the F major nocturne, clearly marking for the listener that new territory has been reached. In the C minor nocturne, the boundaries are more fluid, and the dramatic intensity gathers gradually. The F minor nocturne had begun delicately and simply in the A section, with semplice e tranquillo, dolcissimo, and delicatissimo markings. Out of this peaceful mood breaks the furious con fuoco section (m. 25), which holds forth in all its turbulent glory unceasingly for the next 24 measures until it finally peters out and leads, calando, back to the A section material. It is a true return, with the left-hand accompaniment lifted directly from the beginning section. The right-hand melody is also the same, with added ornamentation. In other words, it is no drama at all, but rather more akin to a da capo aria form. An aria provides a momentary tableau within a larger story, and is not expected to contain a complete dramatic span. Neither is this nocturne. The later nocturne in C minor, on the other hand, follows a more linear progression, creating a drama that begins, develops, and ends somewhere new. Instead of having alternating sections with no formal, stylistic or rhythmic bleed, as in the F major nocturne, the musical forces introduced in the B section (mm. 25-48) affect the restatement of the A section at the end of the piece (mm. 49-77). On a structural level, this is most keenly felt in the development of rhythmic pulse throughout the piece. In the A section, the rhythmic streams break down into groups of two and four, with the two highest levels of subdivision being eighth notes and sixteenth notes (all in duple groupings). The B section maintains this stream throughout the entire first statement of the chorale (mm. 25-36). The restatement of the chorale melody soon meets with a cross-cutting force (m. 39), a rising chromatic figure that obliterates melodic and rhythmic flow by introducing a new rhythmic stream: sixteenth notes grouped as triplets. The chorale tries several times to go on to completion, each time only to be interrupted yet again, until the rambunctious triplet stream eventually takes over completely by m. 46. All hope of a “there and back again” form is not yet lost. Like the F minor nocturne, this tempestuous contrasting section may still peter out into a restatement of the A section just as it was in the beginning of the piece. But it is not to be. Instead, the new triplet stream introduced in the B section carries over into the restatement of the A section, beginning in m. 49. Like a locomotive, the momentum of the chromatic triplet motive has gathered to such a point that it would take a major opposing force to counteract it. Chopin provided no such force, and following section gives in to the inertia. This results in two opposing streams occurring side by side—one dividing the beat into four sixteenth notes, one dividing it into eighth-note triplets. It is a typical hemiola effect, with the undergirding of an extraordinary formal rationale. The transformation of the A section material is the result of the developmental nature of the B section. Recall the B section of Op. 15 No. 1. The fiery nature of that section was consistent from beginning to end, bookended by two relatively calm sections. The B section of Op. 48 No. 1, on the other hand, builds gradually, constantly adding both in dynamic level and rhythmic intensity. The difference between these two story-lines can be graphically represented—though roughly—by a series of bars, where an increase in the height of the bar reflects an increase in inertia (increase in inertia in this case results from an increase of various musical elements such as dynamic level, rhythmic interest, and range). This story-line fits much better into the mold of a drama than the F major nocturne. As a result, David Rowland’s observation about drama in Op. 48 No. 1, stated above, can be expanded. This piece not only has drama, it seems appropriate to talk about the piece as a drama. The fusion of these two contrasting rhythmic streams in the A’ section has many ramifications, including grandiose figuration, rhythmic tension, and an increasingly dense texture. Grandiose figuration occurs in both the left and right hands, where the eighth-note triplet has become the basic pulse for the accompaniment. This underlying pulse creates rhythmic tension with the melody, because the latter retains the subdivision into groups of four sixteenth notes from its initial statement. The result is a recurring four against three rhythm (see mm. 54, 55, 58, 59, 66, 68, and 69-70). Also, the texture of this final section, although consistent on a wallpaper level, changes subtly by adding density. In mm. 49-62, the left hand has only two notes in a chord at a time (with a lone exception in m. 51). But in m. 65, at the beginning of a new phrase, a third note is added to the successive chordal inversions in the left hand, making an already dense texture even more so. This continues until m. 71, the start of the final cadence of the piece. From this point on, there is a denouement, gradually reducing the density of the texture to the end of the piece. What a difference the accumulation of one new element can make. It is representative of a subtle shift in Chopin’s approach to the nocturne, one in which formal sections are not hermetically sealed but have the ability to influence one another. And although this nocturne may have been the first to reflect linear progression on such a scale, it was not the last. The A’ section of the other nocturne in Op. 48 (No. 2 in F# minor) also undergoes a transformation, though not primarily through rhythmic developments. In No. 2 it is the melodic, harmonic, and phrase structure that differs from the first A to the last—the very elements that are retained in the second statement of the opening C minor theme. But by either compositional technique, Op. 48 represents a departure from the prevailing da capo form in Chopin’s nocturne style, towards nocturnes that were through composed. In the Romantic conception of the natural world, as John Muir so lucidly illustrates, communing with nature was not simply a matter of delighting in its newly aestheticized beauty. Rather, it was a portal into sublime, transcendent realms, as well as a mirror turned to the Self. Muir wrote: “The clearest way into the Universe is through a forest wilderness.” For composers of the era (particularly German ones), deeply concerned with the question of the “Universe,” the question thus became one of mimesis, of how to conjure the spiritual awe of the wilderness on its own terms while also representing what we “receive” by interacting with it. The question of nature was never purely about the abstract contemplation of transcendent, boundless properties, what Kant might describe as the mathematical sublime; it was also about how we, as humans, fit into the grand cosmic scheme. Exterior nature was simply interior nature writ large. A profound ambiguity characterized much of the Romantic perspective of nature. It existed outside of civilization, which, in the wake of rapid industrialization, was becoming increasingly noisy, foul, and dirty. Beyond the “dark satanic mills” of Blake, nature was symbolized as a pure, idyllic reality that we had given up in our Faustian pursuit of “progress.” On the other hand, progress wasn’t such a bad thing after all, and, as Peter Coates points out, many people during the early to mid-nineteenth century saw wilderness as just so much unproductive space hampering human growth. These dueling conceptions of the natural world played out in popular notions of what nature sounded like as well, a matter of importance to composers attempting to conjure nature through music. According to Coates, the wilderness was perceived as both “silent and howling:” silent in its noble, profound separation from the noisy affairs of mankind; howling in the dangerous chaos it embodied. Both of these poles found utterance in the music of this period. In addition to describing the contradictory qualities of nature, moreover, writers, composers and artists saw this conflict as endemic to the human soul. We are all, indeed, “silent and howling” inside. Schumann’s Waldszenen, a cycle of nine pieces for piano, perfectly captures a variety of perspectives associated with the Romantic representation of nature as both an external and an internal state (click here to download the score; audio files are embedded in the post). On the most basic level, the cycle incorporates much of the traditional Germanic musical symbolism of nature; in “Jäger auf der Lauer” and “Jagdlied,” for instance, evocations of the hunting horn (waldhorn) are peppered throughout. (For a representative example, see the former, mm. 13-14, with its brash major triads.) In addition, in the echt Romantic “Vogel als Prophet,” Schumann represents the twittering of a forest bird with fleet, upper register flourishes. (Such mimesis is, of course, a standard musical trope going back hundreds of years in the Western musical tradition.) But the composer does not stop at the obvious in his pursuit of vivid evocation. In Waldszenen, a new aesthetic awareness of nature becomes apparent in the composer’s idiosyncratic treatment of form and periodicity. Many of the pieces in the cycle are marked with seemingly odd structural quirks that, if not found within the context of a Romantic piano cycle on nature, might be difficult to explain. Indeed, as Charles Rosen indicates, some of the early Romantics believed that chaos played a major role in creativity and, as previously mentioned, nature was closely linked to chaos. To conjure this sense of unpredictability, Schumann employed asymmetrical forms that successfully eschew expectations and regularity. I will return to some examples shortly. This formal conception is also closely related to the Romantic “fragment” idea, which is similarly elucidated by Rosen. As the author points out, Schumann was a master of this particular aesthetic. Although fragments took a diverse variety of specific forms, we can identify a few elements that played a major role in many of Schumann’s lieder. In some of his music, Schumann shows us images of a process much larger than what is actually represented in the score, an effect often carried out by abbreviating beginnings and endings to make the listener feel as if he has stumbled into the musical action in medias res. Other common techniques of the fragment aesthetic include quotation and the embedding of unrelated musical materials. As I shall attempt to demonstrate, in addition to his lieder repertory, these techniques are found in Waldszenen. The aesthetic of the fragment, in fact, is ideally suited to Romantic musical constructions of the forest. Poets and composers of the day embraced this form due to its perceived “naturalness,” and a clear corollary existed between exterior nature (as exemplified by the forest) and interior nature. Indeed, the fragment is clearly representative of Romantic notions of subjective experience. Waldszenen isn’t a musical portrait of nature composed from the perspective of a detached, depersonalized subject; rather, it’s the representation of nature seen through the eyes of a human narrator. The piece unfolds as a sort of musical interior monologue of a person’s journey into and out of the woods. Furthermore, memory is actively engaged through near-constant evocations of earlier material. Although he rarely quotes himself directly, the score is strewn with references to what we’ve already heard; as if commenting on the fallibility of memory, we are continually presented with vaguely familiar yet tantalizingly distant snippets of music – a chord here, a melodic fragment there, a rhythm that you think you recall but can’t quite place. Waldszenen casts a thick fog over our perception of passing time. Preliminaries out of the way, I will proceed now to a more detailed reading of the attributes introduced above, focusing on three scenes, “Eintritt,” “Vogel als Prophet,” and “Abschied.” The first piece of the cycle, “Eintritt” (Entrance), begins without a real beginning. Instead, the listener is plopped down right in the middle of a light accompanimental figure; the journey, it seems, has already begun before the first note even sounds. This cheerful material lasts for two measures, wherein we’re given only the bass and harmonic accompaniment pattern. In m. 3, the melody enters, but like the beginning of the piece, it catches the listener unawares. Without any preparation, the melody comes in right during the middle of the harmonic progression, on the dominant preparation of IV-V7; just as we’re introduced to this simple theme, therefore, we hit the first cadence of the piece – we arrive before we’ve gotten anywhere. The opening passage is structured in a symmetrical 8-bars, but the musical events don’t play out in a way that is intuitive. When we reach the end of the phrase (on a tonicized V), our closure is aborted by the return of the accompanimental figure from the first measure. Again, without preparation, we are thrust back into the original key, and earlier than expected, creating a stutter in the form. Instead of the introductory four statements of the figure, the first ending anticipates the repeat to produce five, and we’re back where we started. This 8-bar opening sounds misaligned, like the printer accidentally slid the plates into the wrong position: both the harmonic accompaniment and the melody are straightforward, but they don’t seem to match up. When we return to the beginning after the repeat, the nakedness of the opening two measures is all the more striking. Indeed, it sounds like an accompaniment with a missing melody. The melodic entrance in m. 3, then, is recast as simply the continuation of a melodic line that was mysteriously deleted from the first two measures. When the melody enters, its childishness and naiveté suggest our wanderer distractedly humming a simple tune as she enters the forest. She may have forgotten the first part of the melody, but she can jump in at the next phrase that comes to mind. All of this is consonant with Rosen’s thoughts on the fragment aesthetic. We are not simply getting a musical glimpse of the forest; nature, in her harmonically ambiguous wonder, doesn’t appear until m. 9. Rather, this opening is a portrayal of a person’s interaction with nature. The fragmentary musical narrative is just as much about people as it is about nature, a point that is illustrated by Schumann’s vivid musical commentary on subjective memory. Throughout the cycle, material is scrambled to produce a hazy collage of impressions. Does our fair forest wanderer ever remember the beginning of the tune? Five pieces later, she does. “Herberge” opens with a melody that fills in this missing space in memory. The next piece, “Vogel als Prophet,” demonstrates that it’s not just human consciousness that is prone to asymmetry and formal slippage. Schumann’s intimations of birdsong, while stopping short of Messiaen in ornithological accuracy, conjure the darting, unpredictable quality of birds with quicksilver rhythms, high registration, wide leaps, and a juicy semitone relationship between the first and second notes of each phrase. (This last point links Schumann’s birdsong to musical exoticism and the semiotic connection between nature and the “Orient.”) Like “Eintritt,” this piece plays with simple, symmetrical formal structures in a way that’s perfectly in line with the fragment idea, and with representations of nature as unbound from human control. The opening 16 measures of the “bird” passage (before the “prophet” starts talking in m. 19) unfolds in the perfectly symmetrical pattern of 4 + 4 + 8, complete with cadence points where one might expect them. However, as this stable structure comes to a close, we are presented once again with the first two bars of the piece. This tacked-on material throws off the symmetry of the form (4 + 4 + 8 + 2 = 18); moreover, it serves absolutely no function as a transitional element. Instead, just as quickly as we return to the familiar opening passage, Schumann jarringly introduces new material that bears no relationship to the bird music besides sharing a key. The bird, it seems, has turned prophet. The prophet section of the piece (mm. 19-24) is marked by elegance, grace, and nobility. It’s a delicious bite, to be sure, but Schumann only gives us a tiny morsel. Like the opening, the section is cast asymmetrically, with stable material followed by a sudden shift into new territory. Indeed, at the end of m. 23, when the whole texture is transposed to the bVI, the composer marks it “Verschiebung” (shifting). After just a few beats of the new key, and just as suddenly as we entered it, Schumann pulls the listener back into the opening bird material. This whole 6-measure passage is embedded within the matrix of the bird music, although no attempt is made to seamlessly integrate it into the piece. The musical strategy is characterized instead by its fragmentary juxtaposition. The aesthetics of juxtaposition find their most perfect expression in the final piece, “Abschied” (Farewell), a wistful goodbye to the forest. In musical terms, this sense of nostalgia is enacted through a series of faint allusions to previous material from the cycle. “Borrowing” or “quotation” would be too strong of words here; rather, the process consists of recasting familiar material in a new setting. It’s enough to establish identity, but just barely. To name a few examples, the melody at m. 3 is strongly reminiscent of “Herberge” (compare to m. 1 of the excerpt on p. 6). In m. 12, the bass movement (V-vi) through chromatic passing tone is taken from “Eintritt” and “Herberge” (m. 2). The pungent clash of B natural/Bb in “Einsame Blumen” (mm. 12 and 38) make its thorny appearance once again in m. 17 of “Abschied.” In m. 29, we get a melodic turn from “Freundliche Landschaft,” and in m. 32, the chromatic exoticism of the bird sneaks in for a quick appearance. Measure 33 is reminiscent of the “Eintritt” opening melody, and m. 38 reiterates “Herberge” in the left hand. More examples abound, but my point is sufficiently made: the final piece of the cycle collages familiar music to conjure a sense of nostalgia for the forest as it recedes into the background, and through the fragmented chaos of memories, full of half-remembered images and fleeting impressions, Schumann evokes the “silent and howling” interior life of the forest wanderer, who turns out to be none other than the listener. “In every walk with nature one receives far more than he seeks.” Schumann seems to suggest that, in nature, you find yourself. Peter Coates, “The Strange Stillness of the Past: Toward an Environmental History of Sound and Noise,” Environmental History 10/4 (Oct. 2005): 643. Charles Rosen, The Romantic Generation (Cambridge, MA: Harvard University Press, 1998), 95. Rosen also discusses this idea in regard to the fragment. For more, see Rosen, 115. Improvisation is by definition ephemeral. The performer responds to a unique moment with unique sounds that die away immediately, leaving no trace but in the memory of those present to witness it. In the nineteenth century, this sort of music-making model was no formula for inclusion in the burgeoning historicism of the time. How could improvising a stunning fantasia last, earning its practitioner a place in history? Without a means of preserving these performances, we would be left only with first-hand accounts, “ear-witness” reports of virtuosity. There would be no musical documentation to prove it. It’s admirable that RT takes up the question of improvisation here, but he doesn’t probe too deeply into this problem. It seems that, for many of the “Romantic generation,” the point was to appear off-hand and spontaneous while at the same time leaving behind a documentary trace that paradoxically proves one’s virtuosity by freezing it in time. They had figured out a way to have their cake (“improvisatory” virtuosity) and eat it too (preserve it for posterity). It makes me think of the great jazz virtuosos of last century (and today). Minus recording technology, we would be left today to speculate on the genius of Louis Armstrong and Charlie Parker in much the same way that historians speculate on what the improvising Mozart must have sounded like. In other words, if improvisation has any shot at preservation, a technology is needed to serve as formaldehyde in the jar: virtuosi in the nineteenth century had notation, improvisers in our era have audio recordings. Both technologies halt in mid air the fleeting process of improvisation. This passage brought to mind the famous (if scantily documented) meeting between Vladimir Horowitz and Art Tatum in the 1930s. Horowitz was mesmerized by Tatum’s unschooled virtuosity, even going as far as to call him the greatest pianist in the world. No performer of jazz or pop, Horowitz painstakingly transcribed and rehearsed the standard “Tea for Two” and played it for Tatum. (His transcription is preserved in the film “Horowitz: The Last Romantic”; apparently it’s somewhat cringe-inducing.) After this, Tatum sat down and played “Tea for Two” for Horowitz. The great conservatory-trained pianist was stunned, and immediately asked Tatum for the music. “Oh, I was just improvising,” Tatum replied. Listening to this blandly rousing little number today without knowing its history, it could easily be taken as more quaint than revolutionary. Yet Auber’s 1828 opera was anything but harmless; indeed, with a message of both patriotism and anti-government ardor, La muette de Portici (“The mute girl of Portici”) stirred up all sorts trouble (and made its proprietors all sorts of money in the process). The opera came to the French stage at a politically tense time, when the fear of another revolution was acute. The very possibility, not to mention the popularity, of this opera, then, pose an interesting question: in an age of extreme government control of the arts, how could an opera about insurrection pass muster with the censors? The fact of the matter is that Portici was a cautionary tale portraying revolutionary activity as an invitation to mob rule and chaos (or at least this is how the government interpreted it). They may be singing about revolution, but in the end we all know what messy business revolution can be. The message, as RT points out, is deeply ambiguous, and French authorities banked on a mass interpretation that would bolster state power. It would be like Glenn Beck doing punk rock. Of course, any public musical utterance is an interpretive crap shoot. Independent of the composer’s (and the censor’s) design, a work takes on its own meaning as it is used by real people in their historical moment. RT’s last line above may seem like an overstatement, but in 1830, this tune indeed played a major role in the foundation of a modern state, Belgium. It would not be an exaggeration to say, as RT implies, that this music was “weaponized” by the French-speaking Belgians in their uprising against Hapsburg rule. During a performance of the opera (which the nervous government heavily redacted), “Amour sacré de la patrie” served as the cue (or was it a spontaneous reaction?) for mass revolt. Upon hearing this tune, the inflamed audience poured into the streets, storming major Hapsburg strongholds, including the armory, and eventually wrestling power from the overseers. This Brussels performance makes the infamous Rite of Spring debut look like a rave dance party by comparison. Shifting gears slightly, reading about incidents like this (and any of the other famous riots in music history), I can’t help but wonder about the state of music as a cultural force today. It seems fairly impossible that any piece of music in any genre in contemporary America would have the social power, and the consensus, to inflame the passions so radically. Auber’s opera was a mega-hit: it spread to every corner of society, and although its message was ambiguous, its reach was ubiquitous. Is anything comparable even possible now? The way we listen to music today is too fragmented, too diffuse, for any one cultural product to take hold of the collective imagination the way Portici did. Revolutionary politics is still an active force in music-making, of course, but few would argue that it has the ability to truly shape revolutionary activity. (Try imagining a crowd at a Rage Against the Machine concert spilling out of the auditorium and capturing the White House.) Are we too savvy today to fall pray to musical propaganda? Is the music just not as rabble-rousing as it once was? What do you think? Mark and I were recently interviewed by Prof. Marica Tacconi for the August AMS newsletter (view the newsletter here or download it from the AMS site here). The issue also features a great essay on musicology and blogging by the stalwart Ryan Bañagale and Drew Massey at amusicology. Since we’ve fallen behind a bit with the weekly readings (and I trust summer-vacationing readers have done the same..), August will begin with p. 251, our last page of reading before we went silent. We want to keep trudging ahead with the book, but right now might be a good time to take a summer breather. We have to rotate in some beach reading, after all..
July has been a dreadfully slow month on the blog, but I have a decent excuse: I’ve been away for the last three weeks getting married and going on a honeymoon. Now that I’m back home with a computer, let the reading and the posting commence! If anyone would like to contribute to the blog to help fill our summer lull, we’d be delighted to accommodate your posts. Just let Mark and me know.